JUNE offer: "Discount and window as a GIFT"! When ordering white PVC windows of any type in June 2018, for every 5 windows of the order we give window for the bathroom as a Gift ! *This price offer is valid only in June 2018. 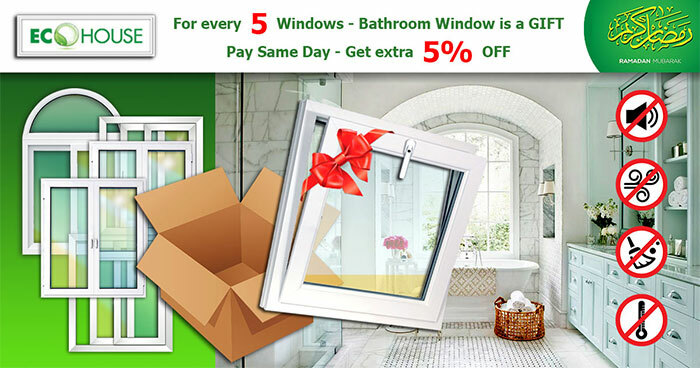 For every 5 windows of the order, get one window for the bathroom as a gift. Window of turn type, with removable mosquito net, single mat glass. Orders are completed within 30 days. Prepayment when ordering 90% of the cost. We have already made forty seven steps towards to our customers. And today it's the time for our FORTY EIGHTH STEP. Gaining strong positions in the market of PVC windows in Egypt we are constantly improving production technology and quality of our windows and doors. Our aim is to provide the full cycle of production and regularly replenish our base with new models of modern equipment. Assembling of windows and doors is set up and today we are bending profile for arched and curved structures with reinforcement metal inside, we produce double-glazed windows using technology "warm edge" which is unique for Egypt. In coming months we are going to offer to our customers multi-colored window profile of "Eco House" production and original glass or glass pack design for your windows.